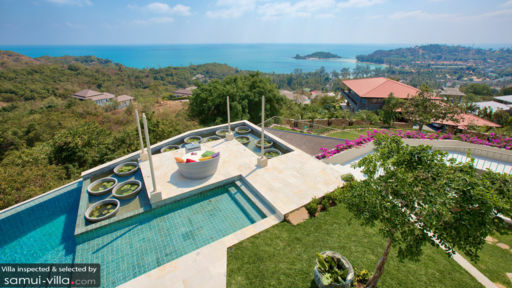 Baan Bon Khao Villa is built to impress. 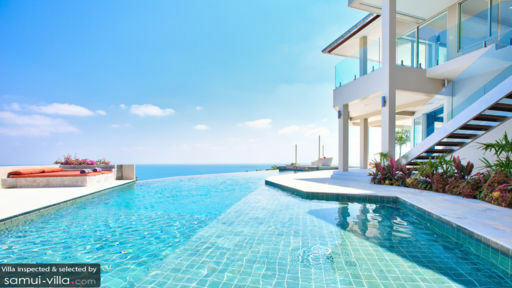 This luxury villa sits upon sprawling grounds measuring over 1,600 square metres, and offers alluring panoramas of Choeng Mon’s picturesque coastline. Indoors, vacation makers will find a series living spaces exuding vibes of modern chic. Venture outdoors, and guests will set sight on a well-manicured garden and stunning infinity pool. The commodious grounds of the villa contain a total of six bedrooms. Two of them are grand master suites, furnished with air-conditioners, roof-fans, en-suite bathrooms and private terraces. The remaining four double bedrooms are furnished in a similar manner to the master suites. The bedrooms are made family-friendly with the addition of fold-out sofas, for it serves as a sleeping option for the kids. The sparkling waters of the infinity pool beckon invitingly to all guests lounging outdoors. The spacious pool measures 25 metres in length, and features a unique deep diving section with a depth of 2.5metres. After taking a refreshing dip, snuggle up upon the pillowy daybeds lining the pool deck for an afternoon of sunbathing. A private sala, lush garden areas and two outdoor bars serve as additional social gathering spots. A set of clear sliding doors lead guests from the pool deck into the capacious living area. The sleek interiors, decked in pristine white, are enlivened with an array of colourful ornaments such as paintings, plump cushions and decorative rugs. Venture to the second floor, and you will find a well-equipped kitchen and breakfast bar that opens out to a waterfall feature in the garden. Each and every dining experience promises to be a pleasure at Baan Bon Khao Villa. Feast indoors in the well-appointed dining area, dine alfresco in the breezy terrace, or enjoy an intimate dinner at the cosy outdoor bar. Taking your meals outdoor is a well-recommended option, for you will enjoy spectacular panoramas of the coast as you wine and dine on a spread of delicacies. Baan Bhon Khao offers housekeeping service, security service, daily breakfast service, welcome drinks and airport transfers. Amenities available at additional cost include personal chef services, child minding services, boat rental, car rental and personal driver service. 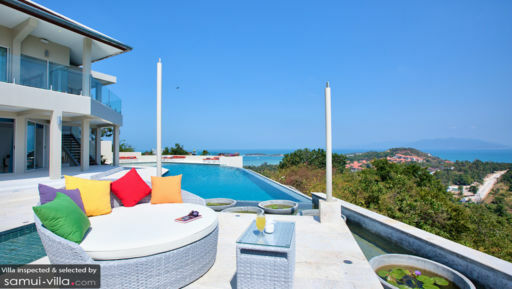 Baan Bon Khao Villa puts guests within walking distance of scenic Choeng Mon beach. A quick drive will bring travellers to an array of popular sites, such as Chaweng beach, the Fisherman’s Village in Bophut, as well as a wide selection of shops, restaurants and nightlife spots. Thank you for making our stay more comforting with your service. We are sure to come back to this villa with our extended family. Loved everything about the villa & service. Best vacation ever. Loved every minute of it even the ones I don't remember:) Yora Thank you for taking such good care of us! Beautiful villa! Enjoyed every moment " Pascal"
Thanks for your service!!! Your villa is very beautiful and staff are very friendly. Thank you very much !!! We are from Kazakhstan we will back again!